Vice President, Prime Minister and Ruler of Dubai, His Highness Sheikh Mohammed bin Rashid Al Maktoum, said that the UAE’s journey of progress, since it was launched by the late Sheikh Zayed bin Sultan Al Nahyan, to its completion by the UAE President His Highness Sheikh Khalifa bin Zayed Al Nahyan, along with the close follow-up of His Highness Sheikh Mohamed bin Zayed Al Nahyan, Crown Prince of Abu Dhabi and Deputy Supreme Commander of the UAE Armed Forces, has focused on building the human capital to provide its citizens all the means of success without segregation between male and female, as both are responsible partners in developing the nation’s capabilities and maintains its gains. H.H. Sheikh Mohammed’s remarks came when he attended the launch of "Gender Balance Guide for the workplace in the UAE" by the UAE Gender Balance Council, the world’s first Gender Balance Guide for the workplace. 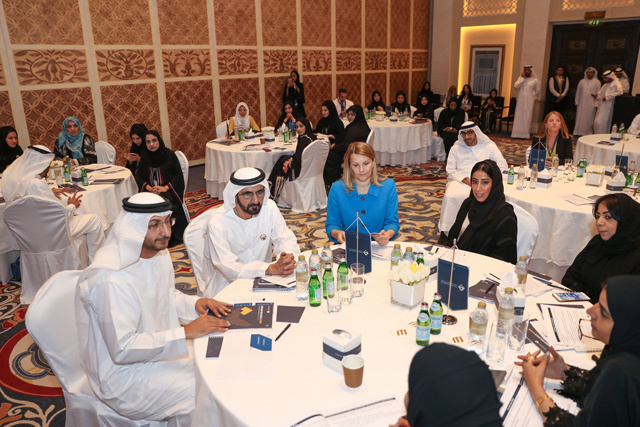 The guide will serve as a comprehensive resource that will help public and private entities in the UAE enhance gender balance in the workplace. The Gender Balance Guide is expected to play an instrumental role in enhancing the UAE’s ranking in global competitiveness reports and serves the UAE 2021 Vision and the objectives of the 2030 Agenda for Sustainable Development. "In 2015, we launched the UAE Gender Balance Council to pave the way for the UAE to achieve an advanced ranking globally and enhance our competitiveness in this domain, and to complete the journey that started decades ago," His Highness said. Sheikh Mohammed also called upon public and private sectors to implement the guide’s rules and guidelines, adding that despite the fact of the UAE’s experience in gender balance has reached an advanced stage, reaping the benefits of this experience won’t be achieved unless all efforts are combined and translated into concrete achievements. Sheikh Mohammed also attended on the sidelines of the event a workshop themed "Enhancing Gender Balance at Leadership positions". H.H. Sheikha Manal bint Mohammed bin Rashid Al Maktoum, President of the UAE Gender Balance Council, and wife of H.H. Sheikh Mansour bin Zayed Al Nahyan, Deputy Prime Minister and Minister of Presidential Affairs, commended the positive results achieved by the federal government, which reflect the leadership’s commitment to gender issues, ensuring equal opportunities and creating a conducive work environment for both women and men. Sheikha Manal expressed her gratitude to all government agencies who participated in the Index. She also stressed the importance of programs and initiatives that support gender balance in the workplace, which is a top priority and an integral part of the National Agenda and the UAE Vision 2021. The guide was developed in cooperation with the Organisation for Economic Cooperation and Development, OECD, and in partnership with various government agencies. The initiative is in line with the directives of H.H. Sheikha Manal bint Mohammed bin Rashid Al Maktoum to work closely and exchange best practices and ideas with prominent international organisations with unique expertise in gender balance. The Guide’s launch ceremony took place at Mina Al Salam hotel in Dubai and included a panel discussion about the Guide. During the panel discussion, Council Vice President, Mona Ghanem Al Marri highlighted the objectives of the council which mainly aims to bridge the gender gap across the sectors in the UAE, and working on bridging the gender gap at leadership positions. She also said that the gender balance is one of the key topics, where the guide came as a comprehensive and simplified tool that will help public and private sectors treat the gender gap through a conducive environment.